Let's face it, the light-and-fast Google Chrome browser is the only way to surf the web-no question, in case you don't know by now, i tell you it is. But whether you're new to the browser or an old veteran, i have got some tricks to improve your mileage. This Google Chrome Optimization Guide will show you which Google Chrome extensions to download and ways to tweak settings you didn't even know were there. Enjoy. Ctrl+N: Opens a new window. Ctrl+T: Opens a new tab. Ctrl+Shift+N:: Opens a new window in incognito mode so you can, uh, shop birthday gifts on the sly. Yeah, that's what this is used for, right? Ctrl+Shift+T: Resurrects the last tab you just sent to the graveyard. You can reopen the last 10 tabs you closed. Alt+F or Alt+E: Opens the Chrome menu. Ctrl+Shift+B: Toggles the bookmarks bar on and off. Ctrl+H: Opens the History page. Ctrl+J: Opens the Downloads page. Shift+Esc: Opens Chrome's Task Manager, so you can see which tabs are using the most resources, potentially slowing down performance. 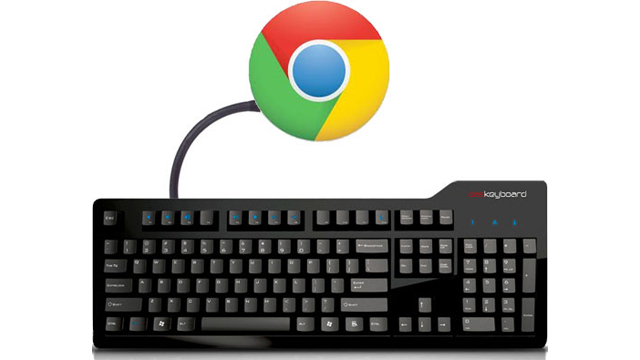 These are just some of the many, many Window keyboard, Google Chrome feature, address bar, webpage, and text shortcuts available in Chrome. If you spend a few minutes each day learning a couple of new shortcuts, it won't be long until you've committed them all to memory. After you swap the icon, sit back and languish in the jealousy of your co-workers! One reason to use Chrome is because it offers a clean and clutter-free interface, a fact that's not lost on competing browser makers who've attempted to emulate the look and feel of Chrome. Even still, there's room for improvement. One way to simplify Chrome's interface even further is to only use Favicons in the bookmarks bar. First, make sure the bookmarks bar is enabled. If it isn't, press Ctrl+Shift+B to toggle it on, or press the Menu button denoted by three lines in the upper right-hand corner (previously the Wrench icon), expand the Bookmarks option, and select Show bookmarks bar. Now that you can see the Bookmarks bar, go through your bookmarks and delete the text of existing ones, and do the same when adding a new bookmark. What you'll be left with is a bunch of Favicons, which not only looks cleaner, but it saves space too. Pretty neat, isn't it? Why settle for a single homepage when you can own two, three, or even a dozen? Or more! We're creatures of habit, and if you're like us, you have a selection of websites you visit every time you fire up your browser. 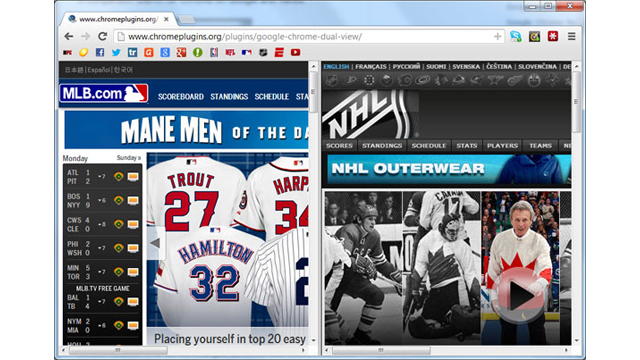 In Chrome, it's easy to configure multiple homepages. Just go to Menu > Settings and select the 'Open a specific page or set of pages' radio button. Click the Set pages hyperlink and start typing in your go-to websites. 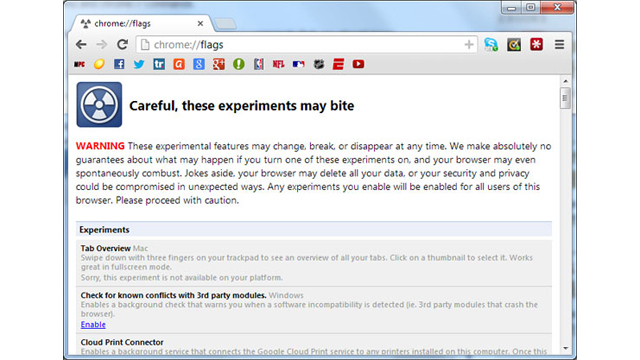 It's not nice to prank your friends and family, but it can be hilarious, not to mention incredibly easy in Google Chrome. Let's say you want to convince your co-worker that AMD just purchased Intel for a mere $35 million (as if!). 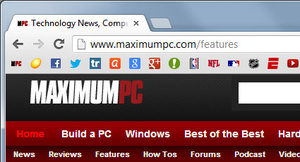 Load up a reliable website for tech news, like MaximumPC.com, right-click an article's headline, and select Inspect Element. 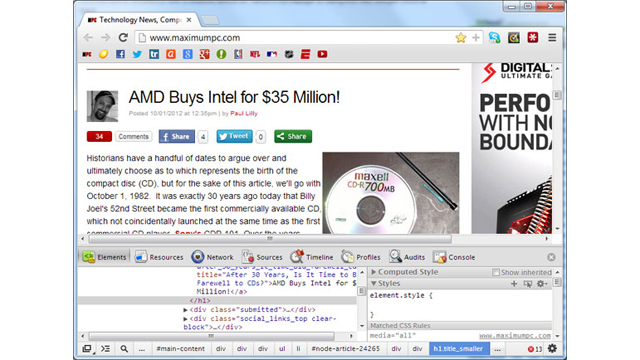 This will bring up a developer console in the lower portion of the browser where you can edit the webpage locally. Change the headline, and if you want to go all out, do the same for the thumbnail image and even the article text. Close out the developer console and all that's left is a fake news story on a legitimate website! Of course, there are practical uses for the developer console that don't include pranking your buddies. It's a neat way to inspect various web code and analyze HTML parse errors to ensure a clean website. Google Chrome is a constant work in progress, and often times the developers will disable certain functions that might not be ready for prime time for one reason or another. If you want to see what they are, and even enable them, type Chrome://flags in the address bar (Omnibar) and hit Enter. Bear in mind that they've all been disabled for a reason, and enabling one could break your browser. Another one of our favorite commands is Chrome://memory, which shows not only how much memory Chrome is consuming, but also other browsers running on your system. There are lots of other commands to play around with. Type Chrome://about to see a list of them. If you're not feeling adventurous enough to tweak your stable Chrome build but still want to experiment, what you need is Canary. What's Canary, you ask? It's the nightly build of Chrome intended for developers, so you may run into buggy behavior on occasion, but the neat thing is Canary can run alongside Chrome at the same time. 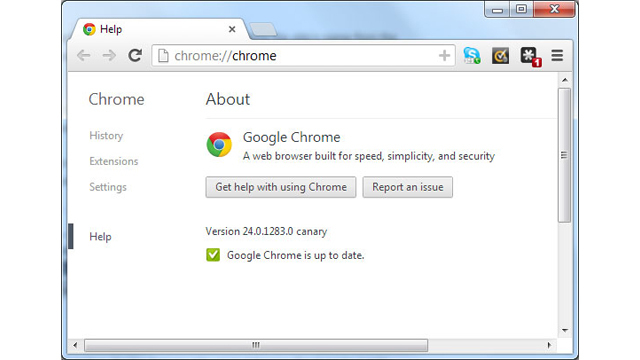 Changes you make to the Canary browser have no effect on Chrome, and vice versa. 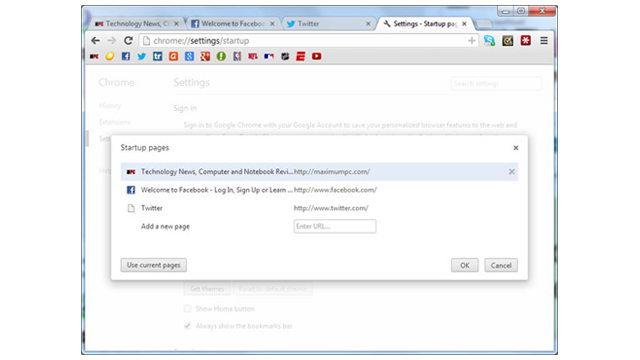 Click the above hyperlink and type in the two webpages you want to view side-by-side in a single, neat window. It's an easy way to compare prices between two online vendors, search results from two different engines, or keep track of different sports, among other uses. 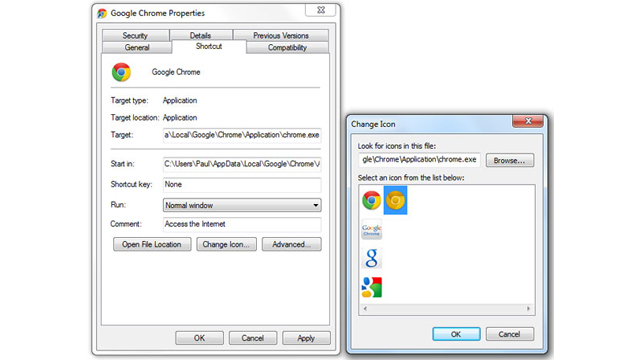 It wasn't all that long ago when creating separate profiles for multiple Chrome users was slightly complicated and involved mucking around Windows folders, copying contents, and performing other tasks. These days it's as simple as going into Settings and clicking the Add new user button under the Users section. 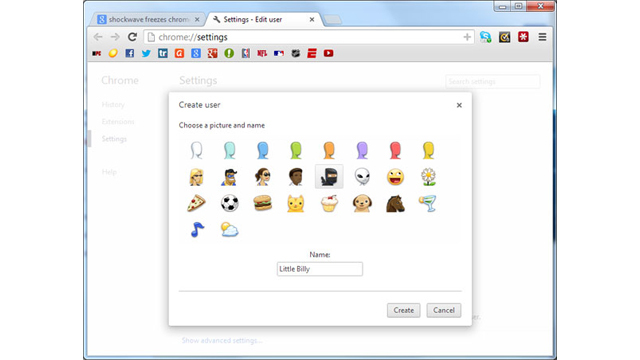 Creating a separate Chrome account is a handy way to keep little Billy's browser settings separate from yours, and also allows you both to sync your Google account on the same PC. What it doesn't do is secure your data from prying eyes, so view this more of a convenience than a security setting. To switch between multiple users, click the icon in the upper left-hand corner and select the appropriate profile. Alternately, you can press Ctrl+Shift+M to switch between accounts. 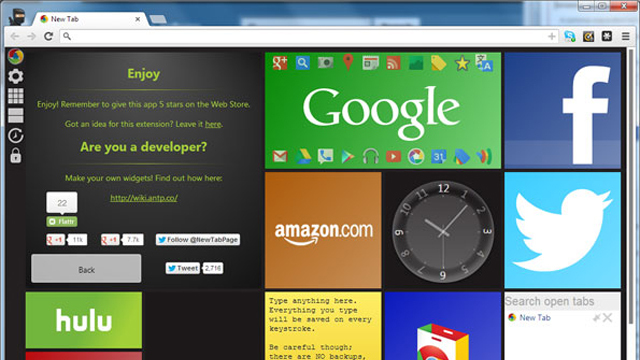 Awesome New Tab Page: Do you know who's awesome? You are, and that's why you need Awesome New Tab Page. In a word, it's 'awesome'. Yes, it looks a little like Metro, or whatever Microsoft is calling the funky UI in Windows 8 these days, but instead of dominating your desktop, it simply spices up Chrome with a highly customizable interface that displays a series of widgets and links. Buffer: Are you addicted to Twitter, Facebook, Google Reader, Reddiit, or Hacker News? Then for the love of all that is holy, do your followers a favor and install Buffer, which will spread your flood of tweets and messages out over time. It's an easy way to stay social, and also the courteous thing to do. Too Many Tabs: There's no shame in being a tab-aholic, nor is there in admitting you need help. That's exactly what Too Many Tabs does — it helps you sort through your bazillion open tabs and find the one you're looking for. Print Friendly & PDF: If you print out a lot of webpages, this is a must-have extension. It allows you to strip out unnecessary items, like ads and other content and wasted space that takes up paper or ink. Pacman: In the old days of computing, you slacked off by playing Minesweeper or Solitaire. Maybe you remember playing SkiFree. There are better time wasters out there, and one of them is Pacman. which is available to play right in your Chrome browser with those familiar sounds that used to cost a quarter to hear.